All In Ones (AIO) are great for outings or when you’re showing off your cloth diaper collection to your friends in hopes to convert them. PUL is great but only comes in a limited array of solid colors and Cotton Laminated PUL is adorable, but the prints you love are hard to come by and wicks anyway. If you have the Little Half Moon Pattern, the answer is easy: Combine your favorite cotton woven (heck, it could even be a great skirt that you found at a vintage shop) and make a wick-less all in one. 😉 Start out with your pattern laid out on your favorite work surface. 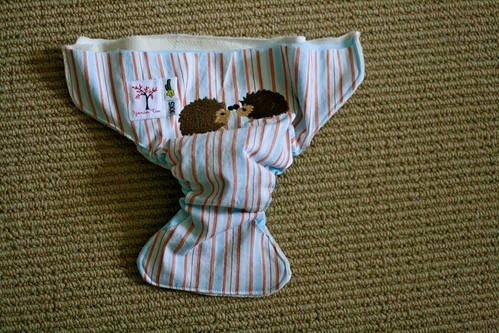 See the two lines on the pattern for each diaper? One is designed for the Inner Fabric (the dotted line) and the other for the Outer Fabric (marked with the dotted to solid lines). When making a traditional AIO, you would cut 1 layer of PUL using the Outer Fabric line and 2 layers of your absorbent fabric on the Inner Fabric line. To make one with a wick-less cute cotton outer, just cut one more layer on the Inner Fabric line, using your outer print. From here it’s easy, all you need to do is fold under the non-matching edges of your print (basically the leg line) about 1/8 of an inch. Lay the cotton layer on top of the right side of the PUL layer (shiny side down) and pin the cotton layer to the PUL. 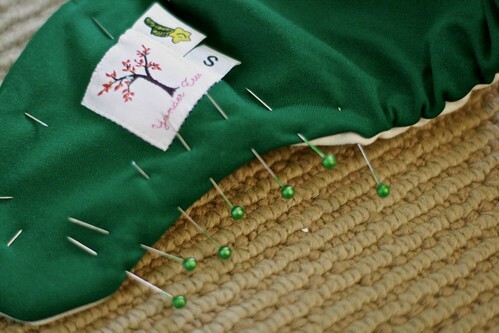 Using a straight stitch, sew the two layers together, put aside. Now it’s time to decide if you want a hidden inner soaker layer (to make a true AIO) or have a removable quick dry snap in soaker (technically making it an AI2). 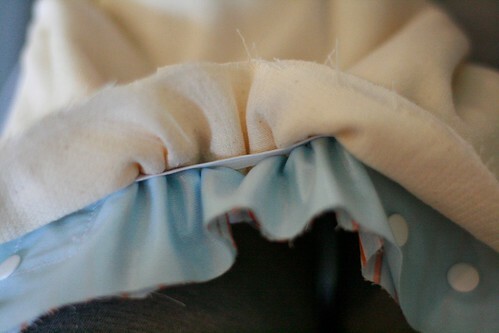 I have a serger, which makes snap in soaker construction a breeze, but if you don’t it’s totally fine to just turn and topstitch (t&t) or just don’t finish the edges and sew them on the inside to the hidden inner layer. 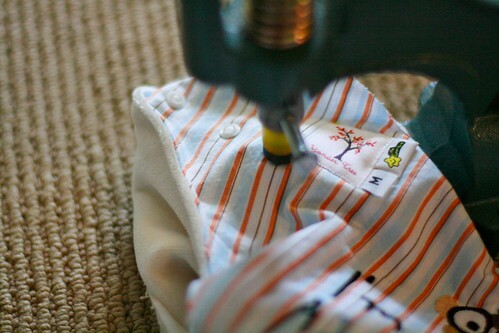 If you choose to sew up a snap in soaker, my free download works great for this. 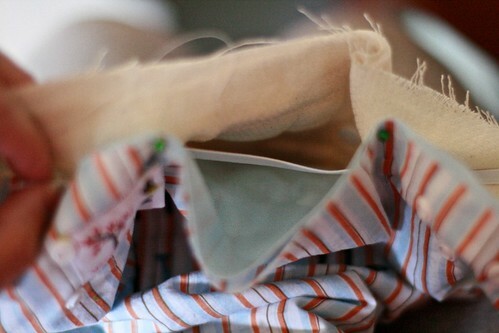 Before serging or t&t, add snaps to the bottom layer of the soaker and the top layer of the inner fabric. Be sure to use a scrap piece to stabilize. 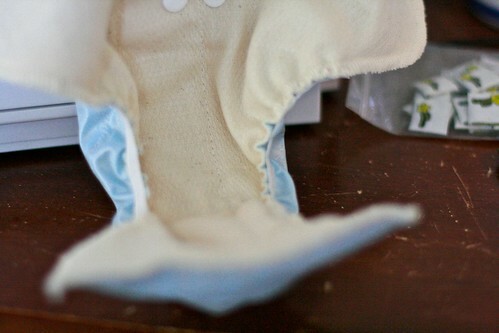 If you are choosing to t&t the whole diaper, now is also the time to apply snaps (or loop, of the hook and loop variety) to the wings. Stack the diaper layers as follows, hidden inner layer, then the inner layer right side up, and the outer layer right side down on top of that (with the cool cotton woven sewn on top of it). Pin edges together. 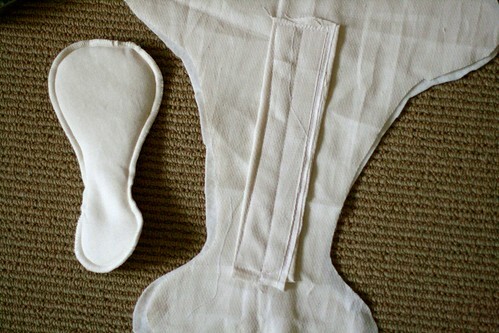 It is helpful to pin the front and back of the diaper first, then match the leg edges up. The outer layer will be “baggy”. This is correct and will all come together nicely when you turn it later and create a nice rolled in appearance. 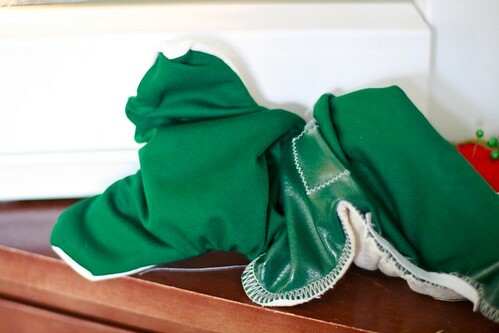 You can opt to make a traditional t&t diaper and sew a straight stitch ¼ inch seam allowance around the entire diaper leaving a 3-4 inch opening on the underside of one wing. Now it’s elastic time! I used 1/4” polybraid for these. You can opt whether or not to use front elastic (I didn’t). The diaper has a larger size range without, however some babies are harder to fit and need this for leak minimization. 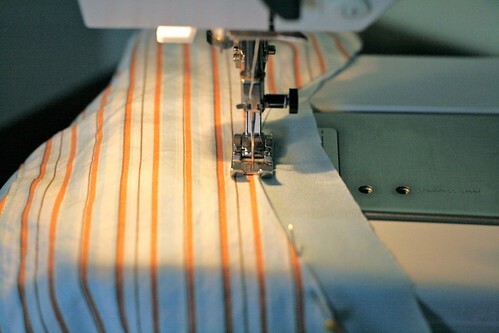 Lay the elastic in the seam allowance even to the starting elastic marking and 3-step zigzag in the seam allowance across the top using the smallest stitch length and a medium width. 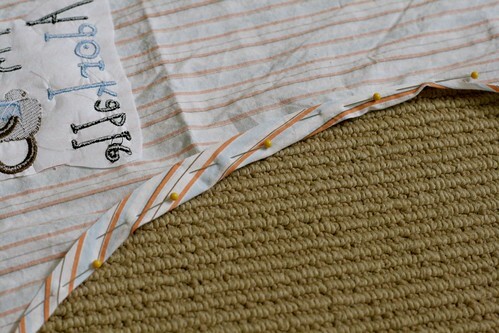 Then, increase to the largest stitch length 3-step zigzag, sew to the end, and then decrease to the smallest stitch length and stop stretching as you sew back and forth a couple times to stabilize it. 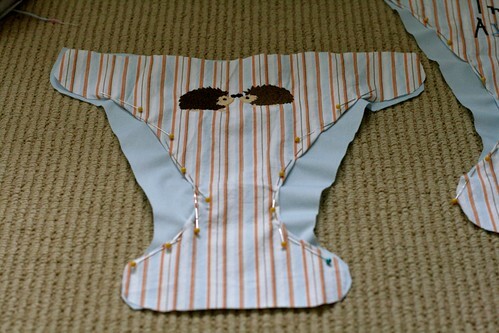 Repeat for sides and back (if sewing completely t&t, if not just the sides). Turn it all right side out. I like to use my bone folder to help smooth the corners and curves. 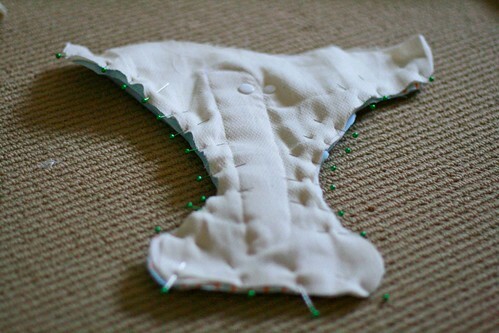 Pin around the diaper as needed to help it lay flat, usually around the elastic points and any curves on the diaper. Topstitch the front of the diaper and then the sides of the wings. If you are serging the back closed and haven’t yet applied the snaps (or the loop) to the wings, if you want them hidden, now’s the time to do it! Pin the layers together where the elastic starting and ending points are for the back elastic level to the top of the snaps. Thread the elastic under the two pins inside the inner and outer layer at the starting marking in the back and 3-step zigzag across the top using the smallest stitch length and a medium width. 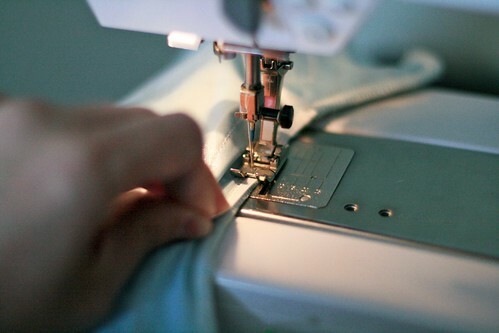 Then, increase to the largest stitch length 3-step zigzag, sew along to the end pin stretching to the max as you sew, and then decrease to the smallest stitch length and stop stretching as you sew back and forth a couple times to stabilize it. Make sure you caught all the elastic by checking the inside. Serge the back closed if half serging or fold the opening closed by turning the edges in following the sewing line and pinning it shut. Apply front snaps (or hook and loop) and lean them up against your snap press and act like paparazzi. Yay! I love your tutorials! Thanks a lot for posting this! What a wonderful idea and it looks adorable like that! Thanks for the tip! I was just wondered… No leaks? 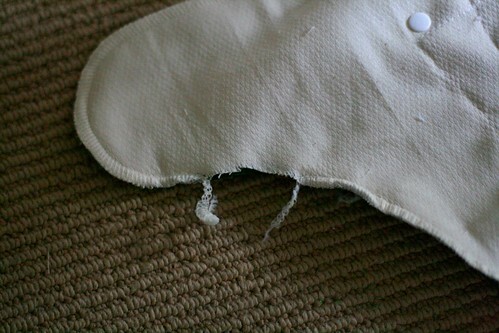 I know that moms had leaks problems when they sew on the pul. Nope, just make sure to use Poly thread and wash and dry on hot to seal the holes before wearing! so you serged the inside of the diaper. Does that work better than just stiching with a sewing machine? I serged and not serged 😉 They’ve both held up fine, serging is just faster in my experience. this is so cool, thankyou for sharing, I bought plain white PUL because it was so much cheaper than the colors and prints, but I was really bummed because I couldn’t have a really cute dipe like some of my other cloth diapering friends, now I can!!!. 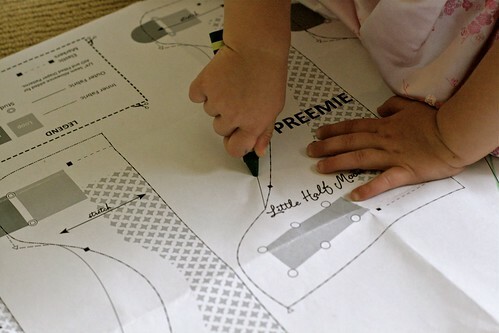 I bought your pattern and found it really useful and newbie seamstress-friendly (if there is such a thing). Much easier to follow. So happy with this new tutorial cos I need not laminate my fabric instead just sewn to the PUL… I’ve already made 4 diapers…. many more to go…. 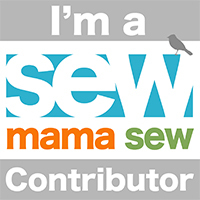 question, can i use other fabrics aside from cotton woven, say like, rib knits, interlock or even minkee? This is wonderful. your dipes are adorable. 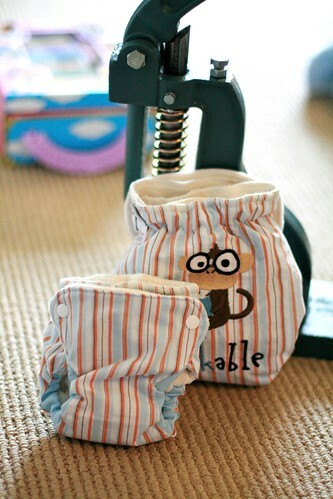 I am very new to cloth diapering, still trying to get the nerve to begin sewing my own, have all the supplies except my aplix which has been ordered.. Was wondering if the same process or similar one can be done with elastic casings, and still be wick proof?? Will this work with the one size pattern? i’m so ridiculously new at this – hadn’t touched a sewing machine in 10+ years until i made my first RRP and my first prefold… looking for away to make a one size AIO with somethin other than pul on the outside. always up for tips! Sure! This would work with a one size pattern. You just need to trim back the leg areas 😉 HTH! I was wondering what fabric you used on the inside of the blue diaper? 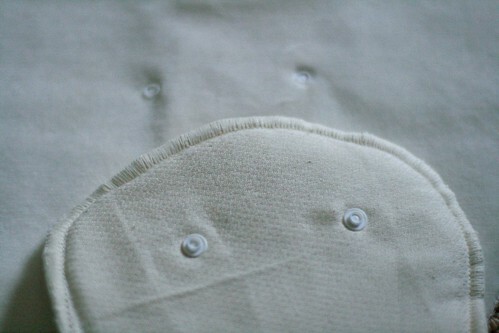 I’ve seen a both a bamboo french terry and a diaper twill that looks similar to it. What fabric do you generally prefer to use?